When was the last time you walked into the dense, lush forest and filled your lungs with pine-scented air? When did you last call a full stop to the madness, the hectic haze that has become your life, to stand still and listen to the wind in the trees, the shrill sound of bird song, the giggling lap of ocean on shore, or the thump of your own heart as you climbed a steep hill? When did you last listen to the wisdom that can only be heard when all of the noise is far behind you? It has been too long...it is time to return to your senses! As a Life Transitions Coach, I serve as a companion to people who are navigating through significant change and growth in their life. We all face major periods of transition, whether we initiate them or life presents them to us. How we respond ultimately defines who we are. You stand at a crossroads...a point of major decision with major consequences. 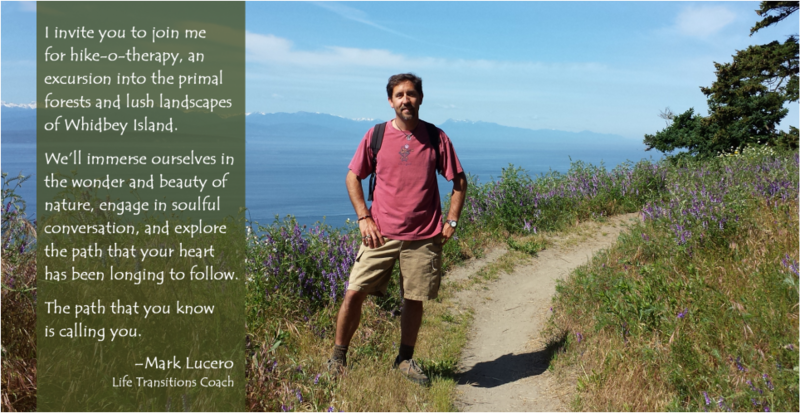 I invite you to walk and talk with me in the wildness and wonder of Whidbey Island’s most beautiful places. Together we will discover the best path forward for you...for the life you want.